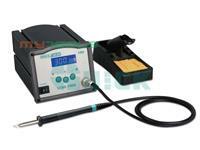 The 1 high frequency eddy current heating, sensor front to front a soldering iron head, can accurately sense temperature changes quickly with the solder joint. 2 heating and temperature returning speed fast. Iron head 3 new reliable grounding system, work for a long time still can effectively ensure the soldering iron head to ground leakage voltage and grounding resistance in line with international standards. 4 easy to handle, the feeling is comfortable, the heating core, Lao Tietou are plug-in type design, convenient replacement. 5 using with LCD backlight, double temperature display design. 6 digital calibration temperature, convenient operation and set a password protection function. 7 can be set according to the upper and lower temperature, to achieve the temperature exceed the standard alarm. 8 can set welding table sleep time and off time. 9 is specially suitable for lead-free soldering.